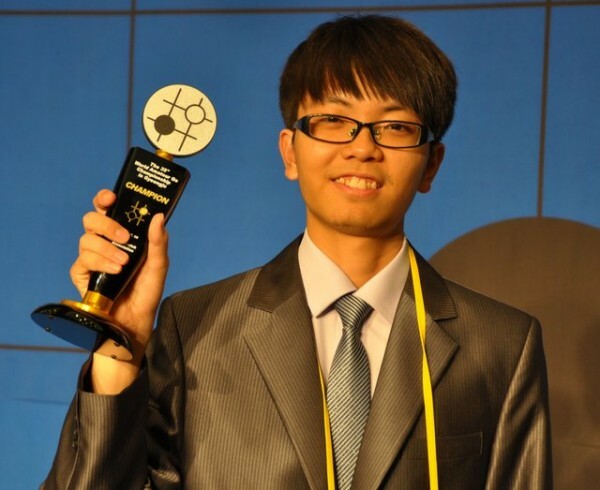 Chinese Taipei’s Yitien Chan won the 2014 World Amateur Go Championship on July 9, narrowly edging out Korea’s Taewoong Wei and Ruoran Wang of China. The three were all 7-1, so the winner was decided by SOS (sum of opponents’ scores), with Taipei scoring 46 to Korea’s 45, and China in third at 43. This is the first time in nearly 30 years that a country other than the “Big Three” – Korea, China and Japan – has won the WAGC; the last time was 1986, when Hong Kong won, and in recent years, Korea and China have dominated. “The most important thing is to have a good mindset,” Chan (right) told the E-Journal, explaining the key to his victory. “When the situation is not good, just calm down and find a way out.” Past the age at which he could turn pro in Taipei, Chan is in his senior year in college, where he’s studying economics. 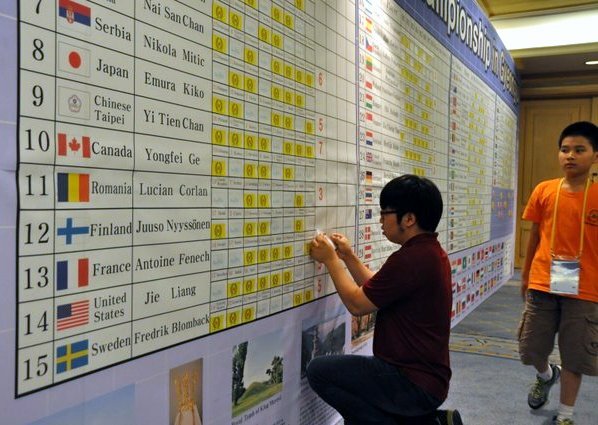 The 2014 WAGC top 10 was filled out by Hong Kong (4th), the Ukraine (5th), the Czech Republic (6th), Russia (7th), Sweden (8th), Japan (9th) and the USA (10th). Click here for complete 2014 results and here for all WAGC winners 1979-2013. Round 7: Early morning fog on the final day of the 2014 World Amateur Go Championship gave way to a clear sky and magnificent views of Lake Bomun. But news of the approach of Typhoon Neoguri left many WAGC players worried about their return flights, and there was turbulent weather on the go board in the 7th round as well, with numerous upsets and even a forfeit. Disappointed by his country’s shocking 7-1 loss to Germany in the World Cup semi-final, Brazil’s Csaba Deak earned an equally easy win over Azerbaijan when Bahadur Tahirbayov overslept and missed his morning match. Czech Lukas Podpera won comfortably against Japan’s Kiko Emura, a bitter result for Emura who was pulling out all stops after his disappointing 8th in last year’s tournament. A large Russian group was fatally encircled by China, leaving Dmitry Surin far behind, though the Russian stubbornly played through to the end of his 37-point loss. Korea forced a resignation from the US (click here for the game record) and Chinese Taipei defeated Thailand, leaving the three Asian go giants locked in a tight battle for this year’s title. At the end of the 7th round, Korea and Chinese Taipei had the same tiebreak score of 30 with China close behind with 28, which meant that, assuming that these players all won their final games, the overall winner would depend on the results of their previous opponents, so reporters were keeping a close eye not only on the top matches but on other key ones as well. Round 8: In the final round on Wednesday afternoon, Hungarian Pal Balogh had no fear of his Korean opponent, dubbing himself ‘Balogh The Great’ on his score sheet and launching into the infamous taisha joseki, neither of which impressed Korean powerhouse Taewoong Wei whose solid, powerful play soon forced Balogh’s resignation. After being mauled by Korea in the previous round, Jie Liang of the US fared no better at the hands of China (click here for the game record), coming up winless for the day when his time ran out, while Canada’s Yongfei Ge could not erase a 10-point deficit against France’s Antoine Fenech in the endgame and resigned. Costa Rica’s Luis Enrique Boza Araya once again put his money on tengen in one last stab at chalking up his first score, but Azerbaijanian Tahirbayov, rested from his morning’s slumber, prevailed. In a tense showdown between Russia and the Ukraine, it was the latter who took control, fending off the Russian incursion into his territory. Mexico developed a winning position against India but Ricardo Quintero Zazueta managed to give away the game to Sonia Shah in a slip under time pressure. Random Notes: Hungary’s Pal Balogh uses almost no time on his clock yet he always seems to be up walking around the playing area checking out other games…Though most of the players either dressed casually or wore sports coats, India’s Soni Shah brought some welcome sartorial cheer with her colorful saris…No matter how much trouble his stones might be having on the board, eleven-year-old Rafif Shidqi Fitrah always had a bright smile and was clearly enjoying every moment of his time at the tournament…Long after the final game of the tournament had finished, Russia’s Dmitry Surin and the Ukraine’s Bogdan Zhurakovskyi were deep in a review of their game, a perfect example of the power of go to transcend political turmoil. Shah and Fitrah both won special prizes, as did Nhat Minh Vo of Vietnam and Brazil’s Csaba Deak, and Lucian Corlan (Romania) and Tiawattananont Thanapol (Thailand) won this year’s Fighting Spirit awards. - Reporting by John Richardson and Chris Garlock, photos by John Pinkerton and coordination by Ivan Vigano. Thanks to Thomas Hsiang for translation assistance with the Yitien Chan interview. Click here for Ranka’s complete reports and here for complete results.